94/365 – “On the Go” nr. 5, a photo by Luca Rossini on Flickr. At the end of an enjoyable long ride across the region, and an equal (it seemed!) walk across the dunes of the Southern Sicilian shore, we finally reached what I’ve been told is one of the most beautiful Italian beaches (I can’t really tell since this is also the first Sicilian beach I’ve seen): Calamosche. The place, incredibly wild and flourishing, was surrounded by a gold sky, resulting from veil of sand raised by the strong wind. 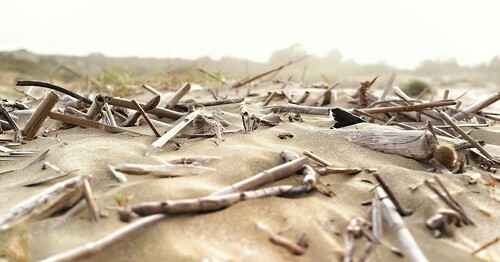 This macro shot shows how the typical nature on the sand of Calamosche looks like, but also how the Carl Zeiss 35mm is able to produce detailed macros even with such shallow depth of field. For some reason (lots of sand in the air?) the sky made the post production harder than usual. I used snapseed again, with Tune Image, Selective Adjustment, and a bit of Drama, but I was way more limited than ever by the sudden appearance of artifacts in the sky. This time I did the cropping directly with Photos (the original Apple’s iPad app).